This is the Iron Man armor you have been waiting for! Since the first official appearance of the massive anti-Hulk Iron Man suit, Hulkbuster, in Marvel’s Avengers: Age of Ultron trailer, fans worldwide have been filled with excitement! The movie-accurate collectible figure is specially crafted based on the image of Hulkbuster in the film. This colossal figure stands approximately 55cm (21 inches) tall and features a Mark XLIII bust inside the Hulkbuster with LED light-up eyes and arc reactor on chest. 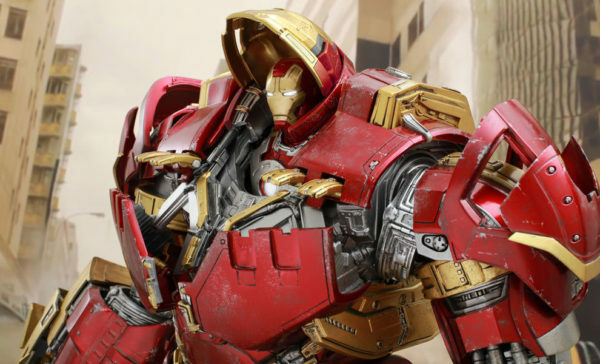 Hulkbuster features metallic red, gold and silver armor with weathering effect, and over 16 LED light-up areas in the eyes, chest, repulsor palms, back, and legs. The Iron Man Hulkbuster will also include an interchangeable battle damaged chest armor plate, enhanced arm articulations and upgraded leg and feet articulations! Hulkbuster offers a new feature to put Hot Toys’ sixth scale Mark XLIII collectible figure (not included) inside the Hulkbuster after removing the included Mark XLIII upper body. There are updated metal joints implemented in various parts of the inner frame, an all-new retracting helmet design so there is no need to swap out the parts and the armor can be displayed in different stages of suiting up. An updated gauntlet design allows you to further recreate scenes from the film with a more movie-accurate and highly detailed mechanical design of the powerful machine arm!